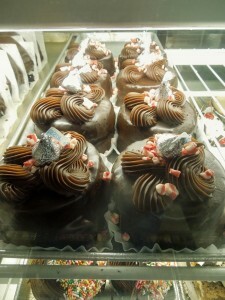 Downtown Rehoboth Beach Bakeries, Open on New Year’s Day, Rehoboth Beach, Delaware Beaches, New Year’s Resolutions will all be forgotten.. I woke up so early and rushed out to see if I could get a glimpse of a sunrise on the last day of the year. Too cloudy; oh well. 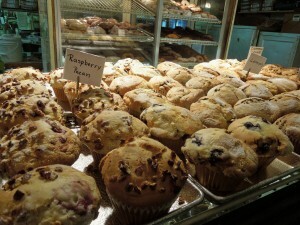 I decided then that a visit to the downtown Rehoboth Beach bakeries would be the thing to do. 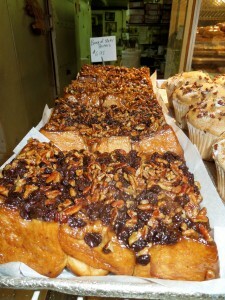 Come New Year’s Day full of 2012 resolutions that will go out the window the moment you see what the bakeries will have; sticky buns, danish, muffins, cupcakes, donuts, breads….wash it down with a cup of coffee; I like it bold, not regular. 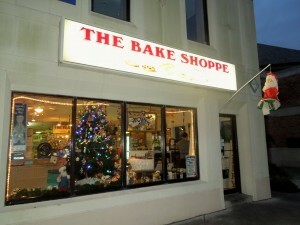 The Bake Shoppe is located at 222 Rehoboth Avenue. Tel. 302-226-0176. It will open at 6:30 a.m. 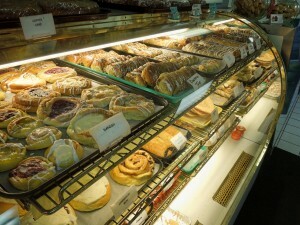 This bakery has been in Rehoboth Beach for so many years. 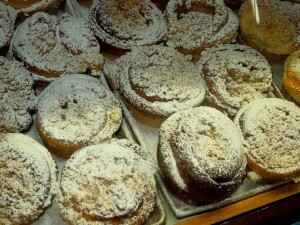 They are known for their traditional Polish Babkas. 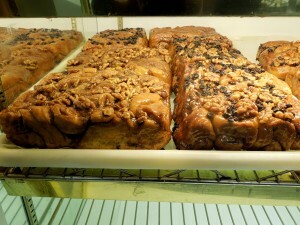 The pictures do not lie; check them out and start drooling. 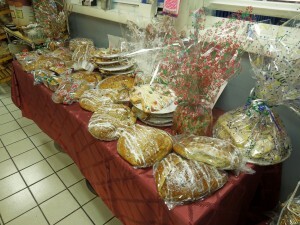 The next bakery I visited was Pasqualini’s Bakery located at 375 Atlantic Ave. Tels. 302-227-2111, 302-227-1086. Website? 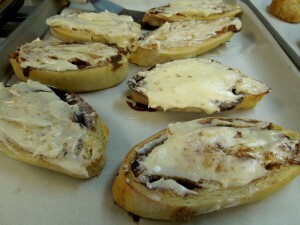 www.pasqualinis.com. 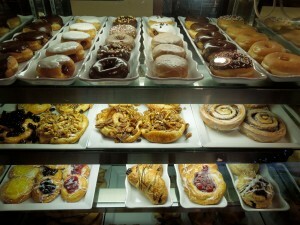 They will be opening on New Year’s Day from 9 a.m. until 1 p.m. 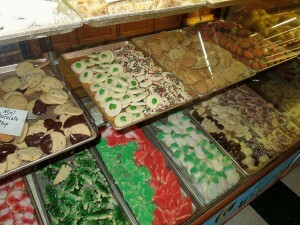 Please note that all baked goods will be 1/2 off. They will be closing until March. 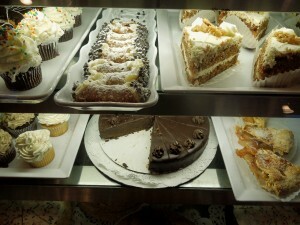 Cake Break is one of the much loved bakeries in Downtown Rehoboth Beach. It is located at 7 South First St. Tel. 302-260-9264. Website? 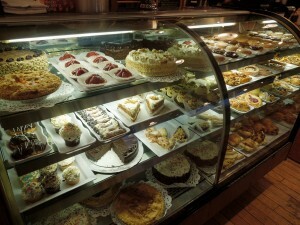 www.cakebreakrehoboth.com. 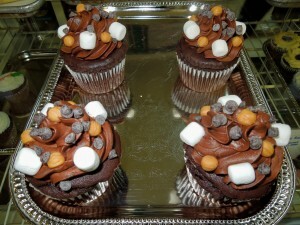 You can find Cake Break on Facebook and Twitter. 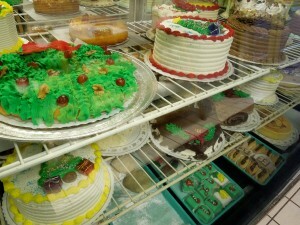 They will be opening New Year’s Day at 8 a.m.
Cake Break is a nut free facility. If you have a nut allergy then you will have no worries. 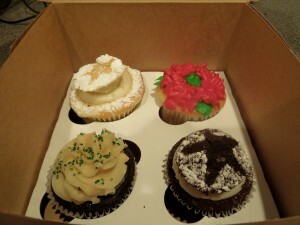 They offer gluten free and vegan cupcakes, as well. Thanks for the coffee Debbie!! My last stop was The Point. 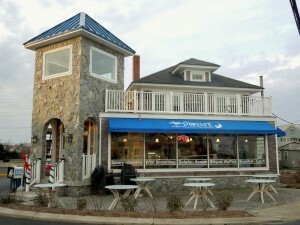 This is a Coffee House and Bake Shoppe, located at “the point” where route 1 meets 1 A. 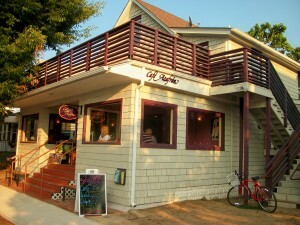 It is 722 Rehoboth Ave. Extended. Tel. 302-260-9734. 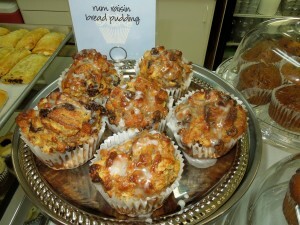 The Point will be opening on New Year’s Day at 7 a.m. until 3 p.m.
Coming in my eyes took off to the case with all the baked goods…..The Point bakes everything in-house and most of the coffees are also roasted in-house. Plenty of seating to relax. 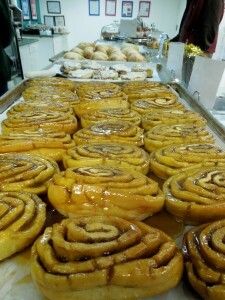 They offer all the sweet stuff like sticky buns, cinnamon buns, made to order waffles, biscotti, croissants, artisan breads and birthday and holiday cakes, as well. Espresso, capuccino, frappes, smoothies and more. Local King’s Ice Cream. Free-Wi-Fi and parking. Order to go or stay awhile. 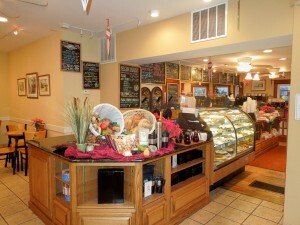 My latte was delicious and thanks Tom for a very nice treat; a biscotti. 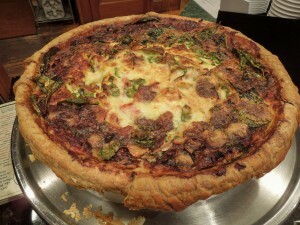 Just enjoying my latte when a gorgeous quiche came out of the kitchen. For lunch they offer salads, sandwiches and soup, as well. To the gentleman from New Jersey that I talked his ear off….it was nice meeting you. And to all of you?….Happy New Year….Much health and prosperity and time to enjoy it all!!! 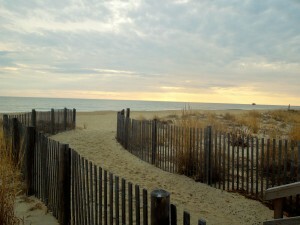 This Holiday Season has been a beautiful one in Rehoboth Beach. Last year it seemed that all we did was dig ourselves from one winter storm after another; this year? Walks on the beach, fairly warm for the time of the year. So many visitors. 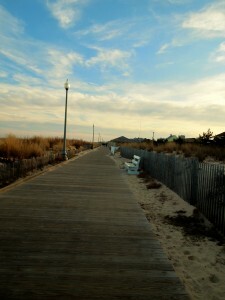 Rehoboth has a great Boardwalk, perfect for early morning walks. Just this week we enjoyed such a walk, right after Christmas. Just make sure that you do just like the locals and natives do; touch either end of the Boardwalk. Don’t ask me why; an accomplishment perhaps? 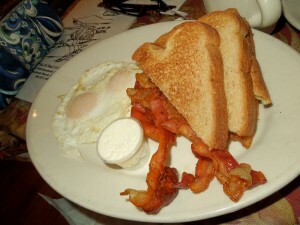 If you are visiting Rehoboth Beach and are looking for a breakfast hangout with some good home cooking, then, Crystal would be the perfect choice. 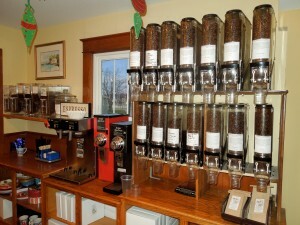 It is located at 620 Rehoboth Ave. Tel. 302-227-1088. They serve breakfast all day long, among other things. Full bar, as well. 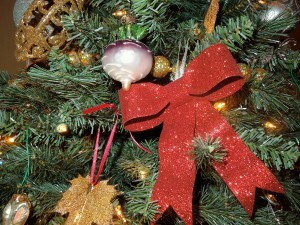 So, after eating, so much for Christmas Eve, Christmas morning…my kitchen was then closed. Crystal was our choice. The restaurant is simple and the service is great. Everyone was hungry and this is what they ordered. 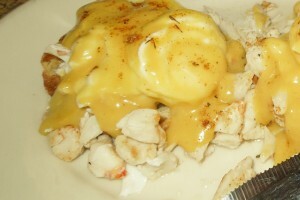 Eggs Benedict with Crab …. it was overflowing with crabmeat. 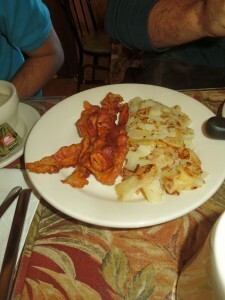 There were sides of home cooked fries and bacon. 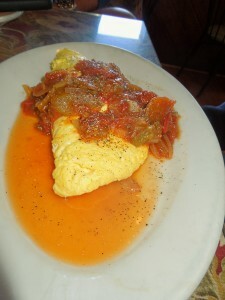 A Spanish Omelette …. a large portion with plenty of Spanish sauce. 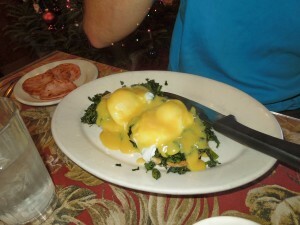 Eggs Benedict Florentine …. another well received breakfast. Traditional fried eggs …. my sister in law thought they were delicious. Then, I did not know what to order. I am never that crazy about breakfast. I was still full from the night before. But, I ordered granola with Greek yogurt and fruit. It was a large bowl but I loved it. 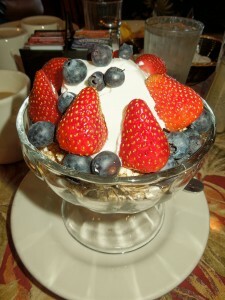 The granola had it sweetness; the Greek yogurt was perfect. The fruit was delicious; I felt healthier. 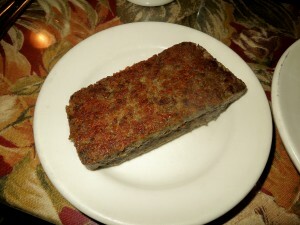 I then stopped our server and asked her to bring me a side order of scrapple, well done; crispy. It really was so good. Not a great combination of foods but it hit the spot. On New Year’s Day as you wake up and think of some of the absurdities of the New Year’s Eve celebrations, this might be the place for you. 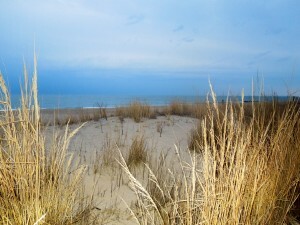 In Rehoboth to celebrate the New Year? You are in for a real treat because the weather is gorgeous and we hope it stays that way. Hello Downtown Rehoboth Beach!! Baltimore Avenue is a trendy street in Downtown Rehoboth Beach with very unique restaurants. 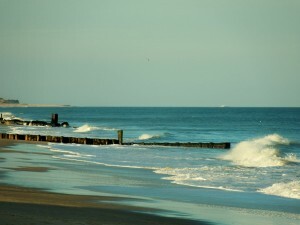 It is parallel to Rehoboth Avenue. Lots of shops, quaint old houses and the ocean at the end of the street. If you want entertainment then Showstoppers!! at Clear Space Theatre would be a special way of ringing in the New Year. A group of talented vocalists will take the stage at 9 p.m. to offer you a brand new selection of big Broadway musical numbers like Bosom Buddies from Mame, Easy Street from Annie and Glitter and Be Gay from Candide, among many others. It is an hour long performance, then a live swing band for the remainder of the evening so you can swing-in the New Year. Dancing will continue until 1 a.m. with hors d’oeuvres and dessert throughout the evening, including a champagne toast at midnight. Venue? Clear Space Theatre, 20 Baltimore Ave. Tickets are $50 each and includes the performance, live music, hors d’oeuvres, dessert and champagne toast. A cash bar will also be available. 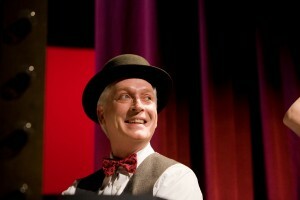 You can purchase tickets online at www.clearspacetheatre.org, by phone at 302-227-2270 or in person at the box office. Cafe Azafran – 18 Baltimore Avenue. This restaurant will have seating availabe at 6-6:30 p.m. and 9-9:30 p.m. $49 per person plus gratuity. They will be offering 3 courses and the dinner includes a salad of baby romaine, radicchio and endive. 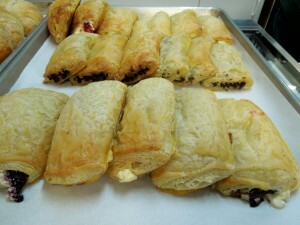 Please call 302-227-8100 and visit their website, www.cafeazafran.com so you can check out the menu for that evening. They open for breakfast on Saturdays and Sundays. Eden is located at 23 Baltimore Avenue. Tel. 302-227-3330. They will be offering an early seating for $85 per person or a late seating for $95 per person, including a champagne toast. Both seatings will have 4 courses. 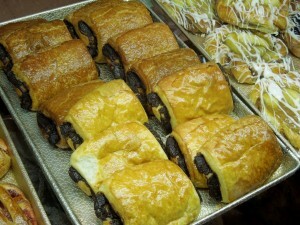 Check their website, http://www.edenrestaurant.com. You will find the menu for that evening on Specials and Events. MIXX will be offering a New Year’s Eve Menu with Pepper Crusted Filet Mignon, Seared Scallops or Surf & Turf. 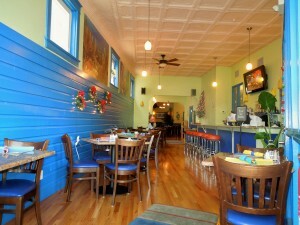 The restaurant is located at 26 Baltimore Ave., Tel. 302-226-8700. Website? 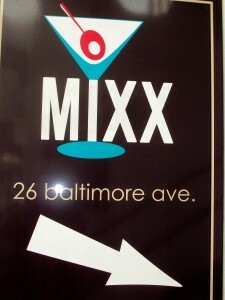 www.mixxrehoboth.com. Blue Moon is located at 35 Baltimore Avenue. Tel. 302-227-6515. This restaurant is celebrating New Year’s Eve and New Year’s Day. Seating in the dining room will begin at 5:30 p.m. 4 courses for $95 per person. Then, you can select from the 4-course New Year’s evening menu with a fabulous show by Pamala Stanley in their warm and cozy Atrium. That will begin at 6:30 p.m. and 9:30 p.m. for $135 per person. New Year’s Day at the Blue Moon will bring a brunch from 10:30 a.m. until 2:00 p.m….Their homemade Bloody Marys or Mimosas….Reservations are suggested. Their Season Closing Party begins at 9 p.m. with drink specials, hors d’oeuvres and entertainment. Sole went through a renovation, opening on their same spot at 44 Baltimore Avenue . Enjoy their new menu and decor on this last day of the year; it is a mix of the old and new. Call for reservations at 302-227-7107. You can find Sole-Rehoboth on Facebook, as well. Sunday is their Pajama Party Brunch – Starting the New Year in a comfortable way. Call them up for reservations and more info. 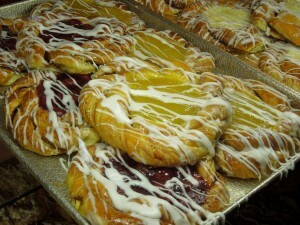 You can check the menu on http://capegazette.villagesoup.com/business/el/sol/150891. Baltimore Avenue is only two long blocks but believe me, it is a happening place in Rehoboth Beach!! 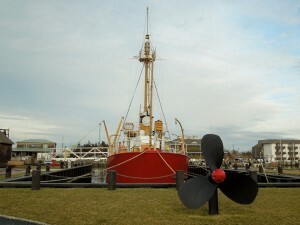 What’s Going On?, Toot the Horn, “Anchor Drop”, Lightship Overfalls, The only National Historic Landmark that does a “Ball” Drop, Historic Lewes, Delaware, 12/31, 11:55 p.m.
New Year’s Eve in Lewes, Delaware, is something not to be missed. Weather permitting a full lighted anchor will be dropped from the mast of Lightship Overfalls, to its deck, with a countdown into the New Year. This is an annual tradition. It is the only National Historic Landmark that does a “ball drop”. Lightship Overfalls was part of manned lightships or “floating lighthouses” that were started by the U.S. government in 1820. It is one of the 17 remaining and one of only 7 of such vessels in the country that is still open to the public. For more info., please visit http://www.overfalls.org. These floating lighthouses could be placed in deep waters where it was practically impossible to put fixed structures; they could also be moved easily. In the mid 20th century new automated lights and radio signals made these vessels a thing of the past. Lighthship Overfalls was built in 1938 and was one of the last to be built. In 1973 it was given to the Lewes Historical Society. 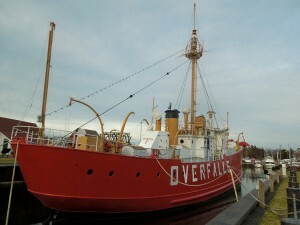 Then, on 12/7/01 ownership was transferred to the Overfalls Maritime Museum Foundation. It is listed in the National Register of Historic Places. So, if you are in Lewes, for this last day of 2011, then put on your party hat and get down to the canal, right at Front and Shipcarpenter Streets. Help everyone welcome 2012, toot the horn and drop that anchor. Comments Off on What’s Going On?, Toot the Horn, “Anchor Drop”, Lightship Overfalls, The only National Historic Landmark that does a “Ball” Drop, Historic Lewes, Delaware, 12/31, 11:55 p.m. 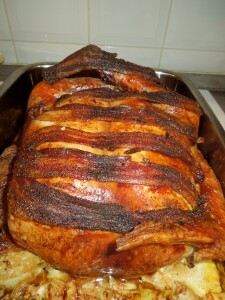 It is becoming a Holiday Tradition in my household to order a Tur-Duc-Hen. And, guess what? 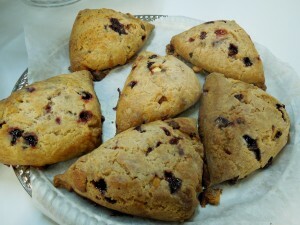 The company that I have tried again and again is Cajun Grocer from Lafayette, Louisiana. Have tried others; they do not compare. 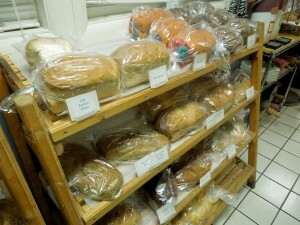 You can read all about it by visiting www.cajungrocer.com. I have mentioned the Tur-Duc-Hen in the past and no, they are not sending them to me so that I can blog about them. They are really delicious, and, defiinitely, a conversation piece at a dinner table. Cajun Grocer offers a multitude of dishes, but a specialty of theirs is this partially deboned turkey, stuffed with chicken, duck and your choice of dressing, which is my case was a creole pork and creole seasoning. Other dressings are available, but I chose the one that was gluten free. The tur-duc-hen arrives ready to cook. It is so easy to prepare. Follow directions. I will tell you that mine took longer to cook than what it said on the package. 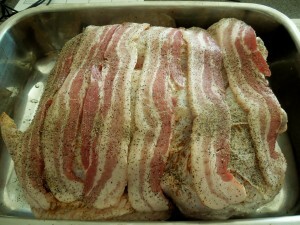 I like to make it my own so I put slices of bacon on the top. 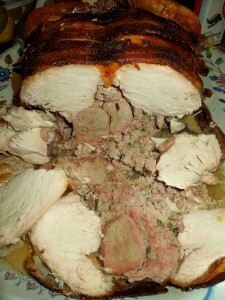 Once it is ready, you let it rest for a bit; just like you would with a regular turkey and then slice it. Your guests will taste the 3 different types of poultry, along with the Cajun dressing that had been placed between each bird. My family raves about it. We had plenty of left-overs since it weighed about 15 lbs. You will get plenty of juices in the pan to make a homemade gravy also. 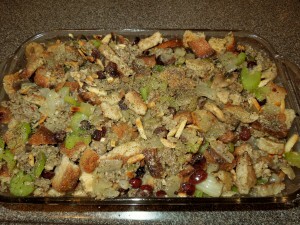 I made extra gluten free stuffing on the side and other trimmings, as well. 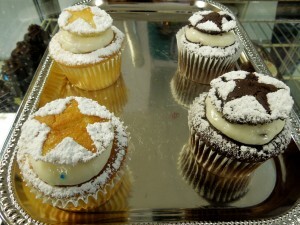 For a sweet ending, we chose cupcakes from Cake Break, located at 7 South First St., Rehoboth Beach. Tel. 302-260-9264. Website? 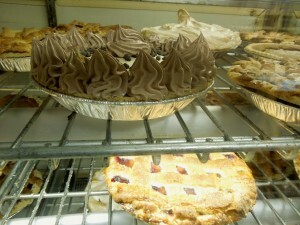 www.cakebreak.com. 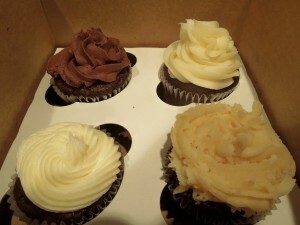 An assortment of cupcakes, including gluten free ones. A hassle free Christmas dinner it was….talk to you later. 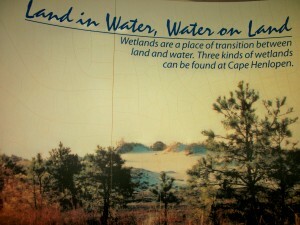 The Cape Henlopen State Park is located at 15099 Cape Henlopen Drive, Lewes, DE 19958. Tel. 302-645-6852. The Park has recreational, historic and plenty of opportunity to enjoy nature; for all ages. 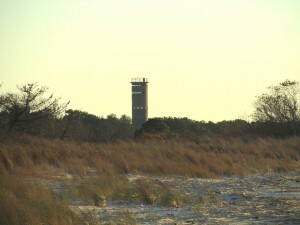 Usually, a lot of the programs start at the Seaside Nature Center, right in the Park. It opens daily, except for 12/24, 12/25 and 1/2. Hours of operation are from 9 a.m. until 4 p.m.
Wednesday and Thursdays – 12/28 and 12/29 – Holiday Break for 6 to 9 years old. Programs of Nature and Exploration. Hands on activities, crafts and please make sure you dress to go outside. Wednesday, 12/28 from 10 a.m. until Noon – Where are the animals at the Park and what are they doing? Learn the skills to discover them, identify them by their tracks. Explore the Park searching for wildlife. The cost is $6/child. Please call to pre-register at 302-645-6852. Thursday, 12/29 from 10 a.m. until Noon. Animal Winter Olympics. 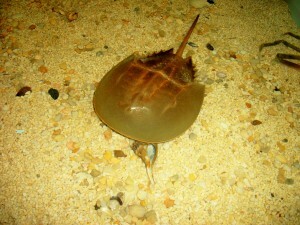 How do you stack up against some of the fastest, strongest, and best adapted animals found in Delaware? Sign up to find out by calling 302-645-6852. The cost is $6/child. Friday, 12/30 – Night Programs at the Park present a Winter Moon Hike at 6:30 p.m. Explore the Park by moonlight, searching for nocturnal life in the Park including deer and night birds. It is for ages 7 years old and older with an adult. $2/child. Please call to pre-register at 302-645-6852. 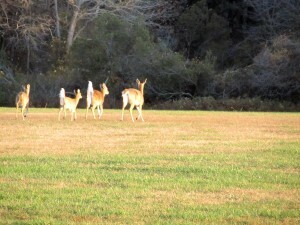 Sunday, 1/1/12 – Winter Hike Series at the Park present the annual traditional First Hike, which is a 1.6 mile hike. It is the First Hike, on the first day of the New Year, in the First Town in the First State – Kick off the New Year with a hike along some of the most scenic and interesting trails. 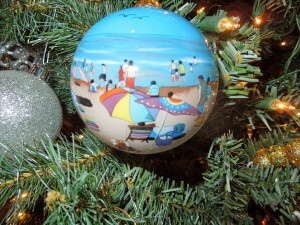 Look for treasures and learn how the Point is changing every year. For more info. and to pre-register, please call 302-645-6852. “Enough is enough, the kitchen has closed.” Some of you might on that mode today after planning, shopping, wrapping, drinking, cooking, cleaning…and then, to start all over again, today? Okay…if you are saying “I don’t think so”, then you are lucky if you are in Rehoboth Beach because two restaurants are opening today. Confucius is a Chinese restaurant located at 57 Wilimington Ave. Tel. 302-227-3848. Website www.confuciusrehobothbeach.com. 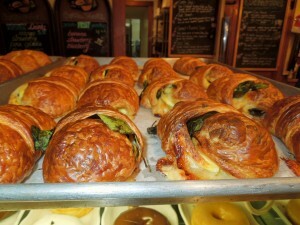 It is one of my favorites and they will be opening all day starting at 11 a.m. The other restaurant which will open for dinner is Summer House. 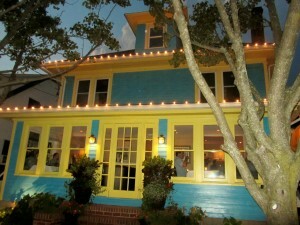 It is a sister restaurant to Big Fish Grill and an institution at the Delaware Beaches. Bar Specials from 4 – 8 p.m.
Dinner will be from 4 – 8 p.m.
And, if by any chance you have forgotten anything at the grocery store, God forbid, Safeway located on Rt. One at 19238 Coastal Highway will be opening from 8 until 4 p.m. 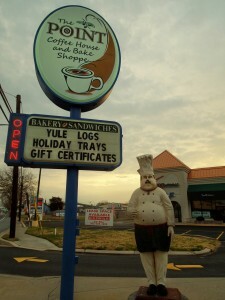 Giant, located on Long Neck on Rt. 24 will also be open today. Running out the door today to get that present that you might have missed or just to even up the stack, or really just to take a walk through Lewes. Then….. 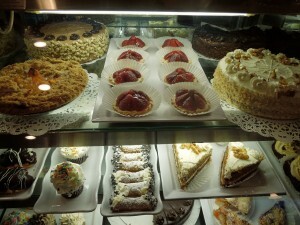 If you get a little hungry then do like Jody and I did on Thursday when we decided to stop at Blue Sea Cafe. 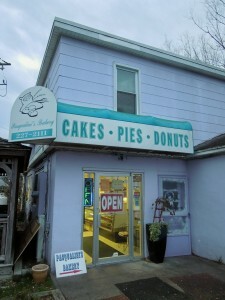 It is located at 108 Second St. Tel. 302-703-2161. Website? 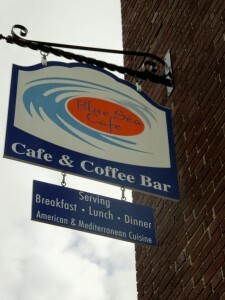 http://www.blueseacafe.com. It is a sister restaurant to Jerry’s Seafood, which is right next door. 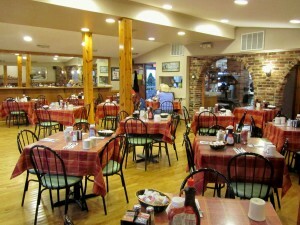 The restaurant opens for breakfast and lunch daily and Fridays and Saturdays for dinner. Blue Sea Cafe is a little bigger than what I expected. The addition of the bar is fairly new. It has a casual atmosphere; very colorful. We sat at a corner table, with views to Second St. People were busy, carrying packages, and chatting with one another. We decided on iced teas, while checking the menu. I wanted something Mediterranean since the restaurant has an American and Mediterranean cuisine. 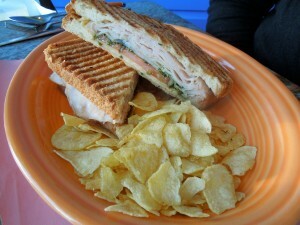 Jody’s choice was a Smoked Turkey Panini with Gouda cheese, tomato and pesto. It came with chips. A nice size panini. I think I remember her saying “this is so good”. 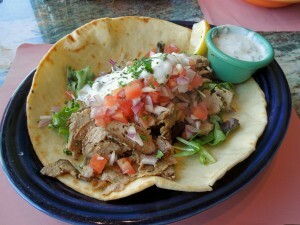 I had not had a Gyro in such a long time. It is, Greece’s version of a fast food. The menu said it was an Authentic Gyro, with seasoned beef and lamb, sliced paper thin and served with that traditional tzatziki sauce. It also was received very well. It was a generous portion; more than enough, but as usual, it was gone in not time. Served on a pita bread with extra tzatziki sauce. Tzatziki sauce is traditionally made of strained yogurt, mixed with cucumbers, garlic, salt, olive oil, pepper and at times lemon juice and parsley. It is always served cold. 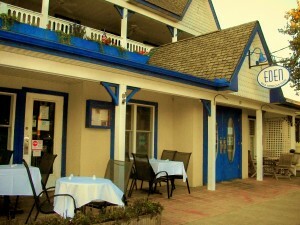 If you try Blue Sea Cafe for dinner let me know……the menu is on their website. 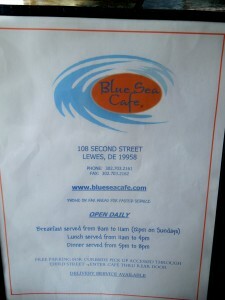 Note: Blue Sea Cafe offers delivery. Time flew by. You know what? I feel so lucky…my friends are priceless!! Love getting together with them. 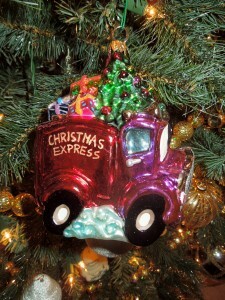 Again, Merry Christmas to you…..